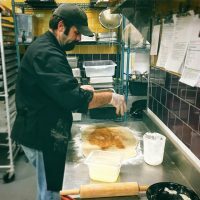 The journey to create The Most Delicious Vegan Cinnamon Roll began a month ago, after Matt Colley, the Kitchen and Deli Manager at the Durham Co-op, acquired a stand mixer (originally for the purpose of making his delicious Stromboli, currently available every week day in our Grab and Go case). 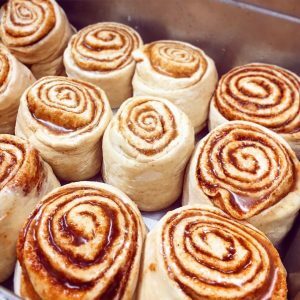 He thought: “What else could I make with this?” On a whim, he made cinnamon rolls to bring to the weekly staff Bullpen meeting – and a dream was born. 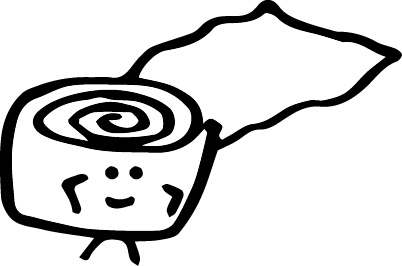 But Matt was only at the beginning of his journey – he was on a mission to make the very best cinnamon rolls he could. And rather than making two separate recipes – one with dairy, and one without – he said to himself: “Let’s just make one really good cinnamon roll that just happens to be vegan.” One great cinnamon roll, to satisfy the masses: could it be done?? Over the next month, Matt tested multiple recipes, baking batches of cinnamon rolls at work and at home to fine-tune his recipe. There were challenges to be overcome – how to make a dessert dough with no fat from milk or eggs? Or butter to make the gooey filling stick? His first attempts ended in frustration. But out of this frustration, good things started to happen. What if he used coconut oil instead of margarine? What if he cooked them in a pan instead of on a baking sheet, to capture more of the gooey goodness? After many home cooking sessions and 5 staff taste tests, he finally had a recipe he was ready to roll out. He was ready to present: The Most Delicious Vegan Cinnamon Roll.